One of the benefits of not blogging daily was the bounty of time I found. 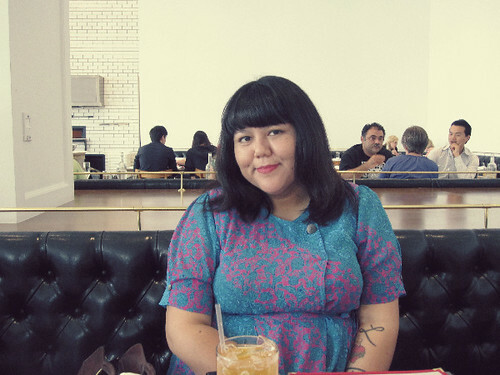 I went out to LA a couple times, and one of the times was meeting Gabby from Corazones Rojos and lunched at Bottega Louie, a restaurant in Downtown LA. She is just as fierce, funny and stylish face to face as she presents herself on her blog. Very few places can make a BLT and fries look glamorous and BL was capital in their presentation. The quality of the food was just as good as it looks. The best part about the place? THE BAKERY! I’ve never discriminated against a cupcake, but after having BL’s cupcakes, I can taste what the big hurrah is about cupcakes. BL not only had cupcakes but they macarons (not to be confused with the macaroon), and after seeing them all over the blogesphere, I had to join the macaron club and have my own set of pretty photos. Apologies for the cliché but I couldn’t help myself. I really loved the aesthetics of the dessert, but the taste I wasn’t impressed by. It was a bit dry, flat and not as filling as I expected. I’m definitely returning to BL for the service, the food and the cupcakes! 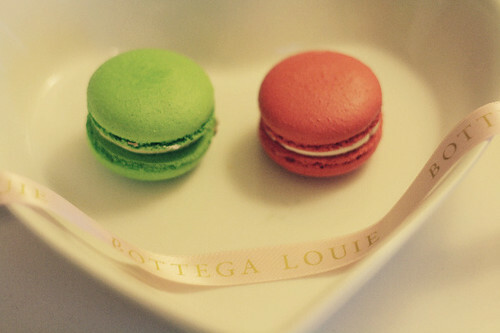 Have you ever tried BL or macarons, or both? What do you think? Was I harsh critic in this French delicacy? 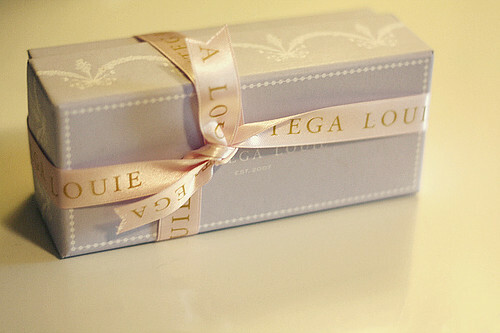 Ohh your macaron photos are so beautiful! I've been = trying to make them myself (and failing miserably) for a long time now, and I'm at the point where I really want to get some professionally-made ones. I don't think you're being too harsh – from what I've read, people seem to go one way or the other – really love them or really don't care for/aren't impressed by them. There is a ton of hype out there with all of the photos and reviews, so I'm not surprised they don't always live up to their reputation. I need to eat some real ones soon so I can form my own opinion, too! I love your photos. 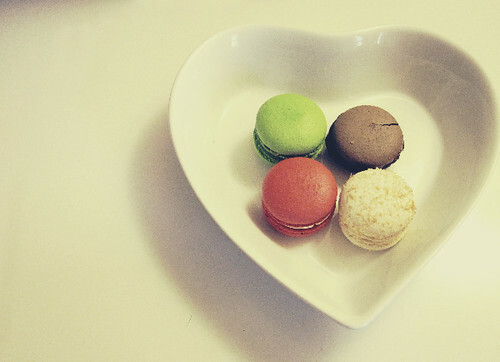 You make simple things like macaroons look like wall art! 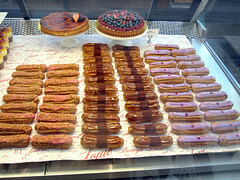 I need to add visiting a French bakery to my list of things to do. While macarons sure are nice to look at, I have heard that they're not as tasty as they are pretty. Guess there's only one way to find out!I love seeing when bloggers get to meet-up! I'm glad you ladies enjoyed each others company. 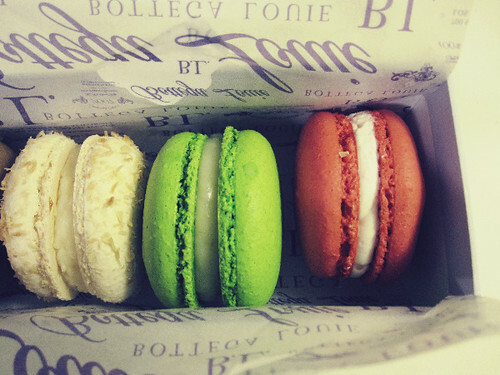 Oh, I love macarons! The ones I had were slightly crunchy on the outside with a divinely creamy filling – not dry and flat at all! However, my mom, who tasted them with me, wasn't really impressed. I thought they were like fairy food. Oh my gosh those are amazing looking! I haven't been to BL but have been wanting to for, oh about over a year now!! haha. I'm always in the area, but somehow never stop in.I'm sad to hear that you weren't too impressed on taste. 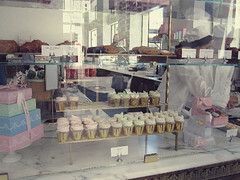 Next time you're in LA try Paulette! Those are my favs. Actually you're from SF? They have a location there too! looks like such a fun place to visit will have to check it out. Macaron's make everything so pretty & happy! Those Whoopie pies look so goood. I want the coconut one! The pictures are fantastic. Glad you had fun in your bloggy time away. Love those photos! I live a block away from BL and have been several times. It never disappoints! Their tarts are to die for. So delish. Love the ambiance and energy there. Glad you had a good experience!! yum and yay for blogging to rl friendships! 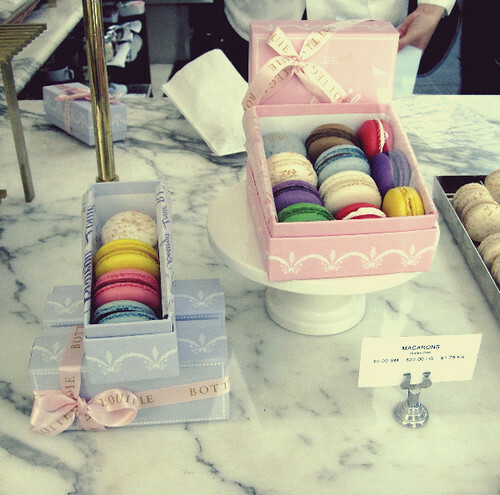 Gosh, those macaron's are pretty! I've never had one myself … I think if I were to get some, I'd have to take photos too. Ay, I had so much fun with you, Diana! So glad we were able to connect and hang out – if even for a little while. I can't wait until our next outing. P.S. Your photos are gorgeous. They definitely make the macarons look delicious, even if they didn't live up to our expectations. Teehee. I did a post about BL too! I love the portobello fries and of course the macs!